Why keep ducks and geese? Eggs and meat, of course - these will be the main reasons. Duck eggs are excellent for omelettes and baking. Years ago a retired farmer still living near to me said that when he was young he entered a victoria sandwich at the West Show and won the class. There were many entries (like the 42 in 2009!) but his was made using duck eggs. He reckons the colour and texture and taste gave his the edge over all the old ladies' cakes! Also, clearing land of weeds and pests - ducks will do a better job than chickens, which is probably down to their webbed feet, the ability to make land rather 'gooey', and the fact that they drill down in the soil searching for tasty grubs, and will even eat ants! Exhibition - breeds have a breed standard which guides the serious breeder in what to strive for re show purposes. Good specimens are quite valuable.Comedy Value perhaps? - it is no coincidence that ducks especially feature in cartoons - the best known must be Donald! Think about Indian Runners or the little Call Ducks. Down - from ducks and geese. The most valued is from the Eider duck. The best duvets and pillows are not polyester - they are still made from either Eider or goose down. Goose down is now mainly a by-product of goose rearing in Eastern Europe and China. However, some unfortunate geese are still being live plucked several times a year, as well as when killed, to maximise the amount of best feather and down that can be produced. Live plucking was still practised in Poland in the 1990's (FAO report) and Hungary was recently still indulging in this practice as revealed in Swedish TV footage in 2010. Watch dogs - geese make great watch dogs, especially the best egg layer, the Chinese. Ducks can be a bit noisy but the drakes are mute. Which are the best breeds to keep for eggs and meat? DUCK - most breeds are seasonal layers i.e. laying from Feb to July - but there are exceptions. If you want duck eggs throughout the year try the Campbells (dark, khaki or white) or Indian Runners, the upright 'walking sticks' which come in 9 recognised colours. Fact: Indian Runners used to outlay the most prolific types of chicken (hardly missing laying an egg on any day during the year). GOOSE - the Chinese. These will beat the rough average of 24 to 30 eggs a year. DUCK - if you want ducks for meat the classic 'de luxe' choice is the Aylesbury, but you will only get 'utility' type or, more likely, Aylesbury crossed with other white ducks such as Pekin. Otherwise, try the Muscovy duck, which besides producing good meat is also a very good broody duck and mother (unlike many ducks, even the wild ones!) The meat has excellent flavour but the flesh is not pale like the Aylesbury's. GOOSE - the Embden at 28 to 34lbs for the gander and 24 to 28lbs for the goose, or the Toulouse at 26 to 30lbs and 20 to 24lbs for the goose. You'll need a big oven! For pate de fois - the big Toulouse would be the usual choice, for the French, I believe. Species of wild geese show a lot of variation in the size and shape of their bill and the breeds do differ slightly in their feeding habits as a result. The Chinese and African (from the swan goose) tend to have relatively larger, longer, and heavier bills which are less suited to short pecks at tight sward. A short sward is however desirable for all geese and geese cannot be used to get long grass into good condition. Any long grass must be removed first; so control of grass growth by mowing or sheep grazing is therefore essential to keep the (high in protein) shoots in good condition. Thereafter, geese improve grass! The same cannot be said of ducks - certainly not to the same extent. Geese are the better grazers by far and can be mainly reared on grass with problems only really arising when pasture becomes dirty causing coccidiosis, with goslings especially suffering and dying from high infection rates of this protozoan and dying from gizzard worm infestation. 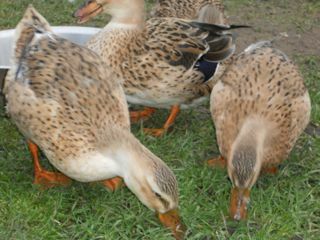 Intensively reared geese and ducks will not generally suffer these problems but since their main food supply is from pellets and wheat they are much more expensive to keep than grass-reared stock. Both geese and ducks are not ruminants and must have grit to puncture the grass in the gizzard so that the juices can be released. Ducks will eat just about everything, or try to! Ducks and geese must have clean water every day. Ponds and streams are, of course, very useful but they are not essential. I use washing up bowls and buckets cleaned and refilled every day. It is important that they are able to get their heads and necks into the water at least to keep eye problems, etc at bay. I feed mine mixed corn, layers pellets and grit/oyster shell all year round and they generally keep very well. They are very hardy creatures. They tolerate very cold conditions and will jump into their fresh water when you have removed the thick layer of ice on those coldest winter mornings. If anything the sun is more of a problem and shade is really needed in the heat of summer. In Guernsey expensive duck houses are not essential and not needed at all if some shelter from the strongest cold winds is available. I have a duck house which I made some years ago and they have never used it! Duck eggs tend to be more difficult to hatch artificially than chicken eggs and goose eggs are more difficult to hatch than most duck eggs. They do much better from broodies i.e. natural incubation. With geese, choose a light breed for sitting and hatching. The larger, heavy females are more likely to squash the goslings as they hatch. Duck eggs take 28 days to hatch except for the Muscovy which takes 35 days. Goose eggs take from 28 days for the light breeds to 30 days plus for the heavy breeds. Geese and call duck eggs are by far the most difficult waterfowl eggs to hatch. For some unknown reason, 2009 was a disaster for goose breeding throughout Britain & N. Europe. Goslings need more care to rear than chicks or ducks and need more greens and space to do well. The limit is about five ducks to a drake, fewer for the large types. Geese seem to like to pair up. Start with chick crumbs then growers mash or pellets before changing to the adult feeding regime. Rats, crows, magpies and gulls will all want the youngsters; rats love ducklings – beware! Ducks lay well and do not need replacing every two or three years; five yeas is probably more realistic. Geese lay for years and seem to live for decades! In conclusion, if you have a little space, try ducks. If you have a fair bit of grassland, try geese!